Gorging on tapas, dancing all night, immersing yourself into a completely different culture or lying flat on a sun lounger, whatever your holiday goals here are some less obvious spots that’ll be sure to sate your appetite and then some. Get yourself to Spain’s super-cool capital, with its city playground credentials you’re guaranteed a fun, culture soaked weekend. Fly to Madrid with Easyjet from as little as £60 each way. The city centre is just a 30-minute taxi ride from the airport where Insta-worthy cafes, restaurants and bars line every street and district. 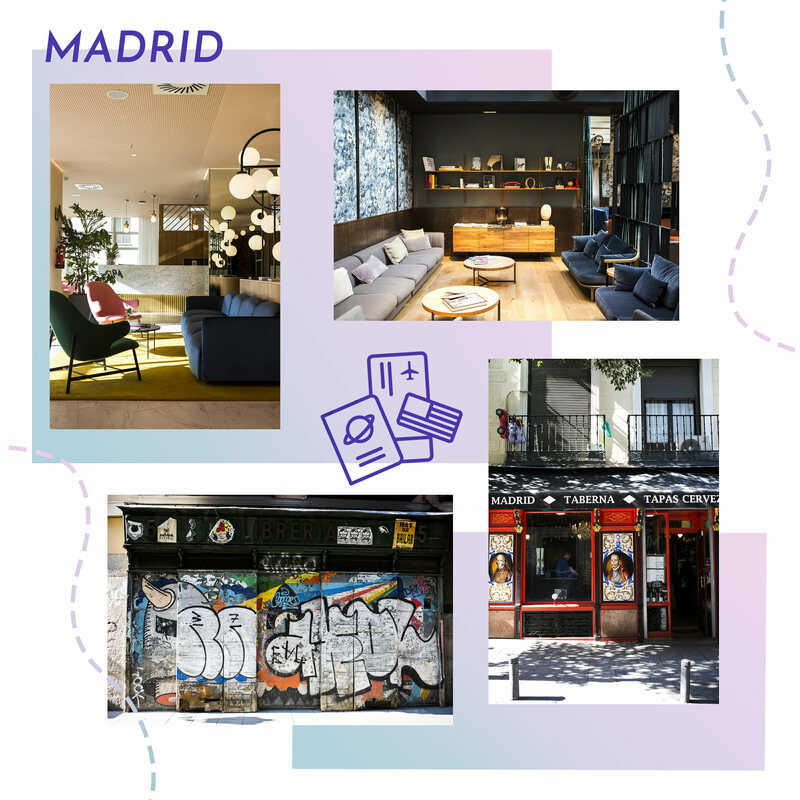 There are plenty of Airbnb’s dotted around the city but we recommend a stay at the pretty luxe Barcelo Torre de Madrid for around £116 per night. Cram in a HIIT session on the 8th-floor gym, cool off in the indoor pool, take a breather on the outside sunbathing deck and sink a few cocktails at the sumptuously designed lobby bar on the ground floor before you hit town. The Malasana district is full of tiny eateries but all the locals head to Ojala, a vibrant restaurant complete with a downstairs ‘beach’ area (erm…it’s just sand on the floor) and rather amusing toilets. Get there early to bag a table on the terrace square, order a bottle of Rioja, some nibbles and soak up the vibes, the food here is brilliantly priced. Further afield, tapas are two-a-penny in Madrid but we like el Leon de Oro in the Cortes district for a proper old school feel. The Chorizo from Zamora and a pint of Mahou will satisfy a quick pit-stop. For a glamourous treat, hot-foot it over to Media Racion, the restaurant at Urso Hotel in the trendy Chueca district. This is where the glam squad lunch and where you’ll find the finest Iberico ham. Taberna Tirso de Molina (there’s no website) in the Latina district is a cute Art Deco style bar that spills out onto the Plaza Tirso de Molina, great for a coffee in the sun and people watching. Take a bottle of wine and watch the sunset at the Egyptian Temple of Debod but avoid the tourist trap over-priced bars and head back down to Malasana after watching the sunset. Sip cocktails at Vacaciones Bar or a gin and tonic at 1862 Dry Bar (no website) as the night goes down. Nightlife is huge in Madrid with most not starting their evening until 11pm. Most Madrileno’s party in the bars but there are some cool nightclubs such as Teatro Kaptial. Saunter down the tree-lined roads of the Salamanca district (Madrid’s answer to Bond Street) and dip in and out of the shops, stopping for a drink at Hotel Totem’s chic bar. Take a breather in the Prado and Reina Sofia galleries and zone out to a Picasso or a Dali masterpiece. Head over to the Parque del Retiro for a moment of zen in the city and hire a pedalo on the boating lake. Buy top quality Iberico ham to take home atJamoneria Lopez Pascual, Madrid’s oldest and finest deli. Madeira is the place for adventure, a small island that packs a punch with its adrenaline-fuelled activities. But it’s not just for thrill-seekers, there’s also plenty of beachside action and nightlife in its capital, Funchal. Madeira sits between Portugal and Morocco and a 3.5 hour flight with Jet2 costs from around £60 each way. Fantastic sunshine heat and a breeze from the North Atlantic helps to cool things down. Stay slap bang in the city centre at The Vine Hotel, a boutique affair at around £170 per night. Bizarrely, it’s part of the main shopping centre. Trust us, it’s chicer than it sounds. Handy if you’ve forgotten your toothbrush as there’s a supermarket downstairs and you’re also amongst all of the action. Leave your heels in the hotel and saunter into the cobbled old town, Funchal. The Rua de Santa Maria street is awash with cafes and bars with on-street dining and an electric atmosphere. Try a mix of European food at Santa Maria Restaurant or for something a bit different, the Nini Design Centre is a quirky mix of design pieces to buy and a chic restaurant with fabulous views over the harbour. Want something more authentic? You can’t beat a feast at Adega da Quinta Restaurant set back into the hills, just a short taxi ride away. It’s a pretty good place to watch the sunset and try the local ‘espetada’ beef dish. The Madeirans love their Poncha, a rum drink made from honey, lemon and sugar cane. Or Madeiran wine if you want to be a bit fancy. Duck into one of the many street sidebars, such as 23 Vintage Bar (no website), perfect for lovers of 80’s music then simply hop from one bar to the other or head back to The Vine Hotel to the rooftop bar by the infinity pool. Don a wetsuit for some canyoning with the Adventure Kingdom. Hire a bike with Freeride and whizz down (or up) the mountains. Hire your own Indiana Jones complete with a jeep and take a tour of the island. Make for the top of Monte and whizz down a hill in a wicker basket, a Madeiran tradition that’ll have you hitting the video button on your phone. Take to the waters and see dolphins and whales with Rota dos Cetaceos as Madeira is one of the best places in Europe to see them in action. Take a 40-minute train ride from Barcelona airport along the Balearic coastline and you will find yourself in Sitges. Fall in love with the tiny streets of tapas bars. Hit the harbour beach for sunbathing, sunsets, and a vibrant nightlife, especially during gay pride (second weekend of June). A value for money hotel is the Galeon, from £100 per night it’s central to the main action with free daily afternoon tea, huge beds and sandwiches served through the night if you come back a little too tipsy. Not to mention tip-top service. Hotel Medium Sitges Park from £98 per night is better for decor and great for poolside relaxing whereas Hotel Platjador from £117 per night has seafront views. Rammed full of brilliant restaurants, you really are spoilt for choice here. The seafront dining is obvious, but you’ll pay a premium, so take to the backstreets for the best places. The vibrant restaurant Nem serves up larger sharing tapas style food but with an Asian twist. Constantly busy, the food is excellent and brilliant value for money. Try the oriental steak tartar, it’s to die for. Guria Taberna (doesn’t have a website) is a fun place for quick pinchos (small food on bread) where you help yourself to. It’s cheap as chips and a favourite amongst locals. El Pou is Spanish tapas done really well, made with good local products. The Casablanca Cocktail Bar & Art Lounge (no website) is a quirky institution in Sitges so sip a Margherita whilst admiring the art that adorns the walls. El Gin Tub serves up a concoction of flavoured gins with late night music, a great combination if you ask us. But the ‘need to know’ is La Clandestina (no website). It’s noisy, fun and full of locals. Join a wine trail at the brilliant Pares Balta vineyard, well-known for their Penedes, Cava and wine. As Sitges is in the Cava region, forget prosecco and get your taste buds revved up for something drier…when it’s cheaper than a bottle of water it’ll be rude not to. The original Bacardi family are from Sitges so learn about your favourite white rum at their very own museum near the seafront complete with cocktail making. Walk along the coastline to the quieter beaches, including some nudist spots. Shake what your mama gave you? Visit Hoi An on a tour through Vietnam and you’ll be hooked. This brilliant village town is a colour sensation that’s not as brash as its capital Ho Chi Minh city or as busy as Hanoi. The sights and smells of this ancient place are mesmerising, especially in November, one of the best times to visit. Known for its silk shops that’ll knock you up a made to measure garment in a day, coffee houses galore and authentic Vietnamese food in the most unlikely places make this a bit of a trip to remember. Stay at the cosy Vinh Hung Library Hotel around £30 per night and just a few minutes walk to the old town. Da Nang airport is the nearest to Hoi An but it’s not a direct flight. For around £700 each way you can layover in Hong Kong but it’s far nicer to see more of Vietnam by flying to Hanoi and spending a few days there first. Exodus Travel have some great Vietnam Adventures on offer with top class guides if you’d rather be part of a group. The Cargo Club Restaurant is the best bakery in town with photogenic French style cakes. Tam Tam Cafe is the oldest bar and cafe set in a typical Ruong house. Morning Glory restaurant is one of the most famous but for value for money, Bale Wel restaurant rustles up all you can eat, build your own spring rolls served along a back alley under a canopy. Sounds dodgy but trust us, it’s a favourite of Gerard Butler’s. Try Hoi An’s special, the Cao Lau noodle, rarely found outside of Hoi An, over at Vy’s market, a buffet style affair. Or pick up a Banh Mi baguette streetside and sit on the river. Lantern Town along the river is the place to go for a Vietnamese Larue beer or their speciality pick-me-up of blended fresh fruit and herbs. Coffee is huge all over Vietnam but in Hoi An, the best place is Faifo Coffee. Climb the steep staircase to the top for views over Hoi An’s rooftops and bustling street scenes below. Get a garment made at one of the cloth shops at Nguyen-Thai Hoc Street just bring along one of your favourite pieces and they’ll copy it and deliver to your hotel. Get up at 5am and head to the river to see the local market in full swing. If you can handle the mad traffic, hire a bike at Vy’s Market for a guided cycle ride through paddy fields to see local syndicates growing a vast array of herbs followed by a cookery lesson and learn how to knock up a perfect Vietnamese dish to wow your friends back home.